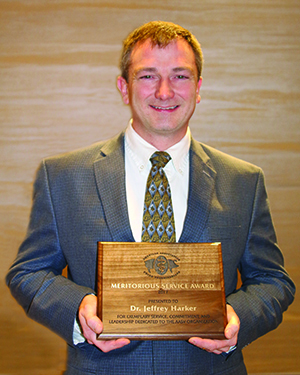 The American Association of Swine Veterinarians (AASV) has honored Dr. Jeffrey Harker (PU DVM ’94) by selecting him as the 2017 recipient of the Meritorious Service Award. The award recognizes individuals who have provided outstanding service to the AASV by consistently giving time and effort to the association in the area of service to AASV members, AASV officers, and the AASV staff. "I really appreciate being recognized by my peers at AASV,” Dr. Harker said in response to receiving the award at the AASV’s 48th Annual Meeting in Denver, Colo. “This association has benefited me my whole career and I continue working to pay back what I have gained by membership in this great organization." Dr. Harker was raised on a diversified livestock and grain farm in south central Indiana. His father built one of the first confinement swine barns in the community in 1980. Interacting with the veterinarians that visited their farm stimulated Dr. Harker’s interest in population medicine and becoming a veterinarian. After earning his Purdue DVM degree in 1994, Dr. Harker joined Dr. Max Rodibaugh (PU DVM ’77) at Swine Health Services in Frankfort, Ind., as an associate veterinarian and then became a partner in 2001. The swine specialty practice serves a very diverse swine clientele ranging from small show-pig herds to contract growers in integrated production. The bulk of their clients have independent family farms. Dr. Harker also has been involved in other organizations, including serving seven years on the Indiana Pork Producers Board of Directors and as the organization’s president in 2008. Dr. Harker currently serves as AASV District 4 director and represents the AASV in the American Veterinary Medical Association’s House of Delegates. He has also served on the AASV Annual Meeting Planning Committee and currently chairs the AASV Continuing Education Committee. In addition, Dr. Harker has been involved with the National Pork Board’s Operation Main Street program since it began several years ago.